Mark Dalton is a middle school teacher in Yreka, CA. A few months ago, he taught his students about solar eclipses. Now, he’s standing at a fire lookout west of town in the Klamath mountains, watching an eclipse begin. “It’s like there’s just a slight little bite out of the lower right quadrant of the disk,” he says. Dalton pulls a welder’s helmet over his head, to protect his eyes. This kind of helmet has a darkly shaded glass window, that filters out harmful UV light and lets him look directly at the sun. For most people in the west, this is what the eclipse looks like. The moon taking a bite out of the sun. But Dalton is waiting to see something more. Northern California is along the centerline of this eclipse. Here, the moon should fully block the sun, leaving only a ring of light visible. In a total eclipse, the moon covers the sun completely. But in a ring of fire eclipse, the moon looks a little smaller than the sun. Eric Anderson is an astronomer, and president of the Southern Oregon Skywatchers club. He says the moon looks small during this eclipse because it’s far away from the earth. Anderson says in a total eclipse, the moon is about the size of a quarter, while in a ring of fire eclipse, it’s more like the size of a nickel. Anderson says people from Alaska to Massachusetts have traveled here to see the ring of fire. “Some people will chase eclipses anywhere in the world, even if its in the middle of the ocean, they’ll go on a cruise ship to watch it," he says. "There’s that level of devotion out there." Back on the hilltop near Yreka, it gets chilly, and the sky darkens a little. And then, after just a few minutes, the ring of fire passes as far as California watchers are concerned. But the show moves on. New Mexico and Texas are waiting to watch it before the sun goes down. “It was just a fleeting thing, but it was certainly indelible in my mind," Dalton says. "I don’t think I’ll ever forget the look of it." For this eclipse, merchants sold lots of protective solar glasses. And people should hold on to them. Astronomers say an even more rare event is happening June 5th. The planet Venus will pass in front of the sun. And that won’t happen again for more than 100 years. Eclipse Of The Sun: Did You Fall Into The Ring Of Fire's Path? 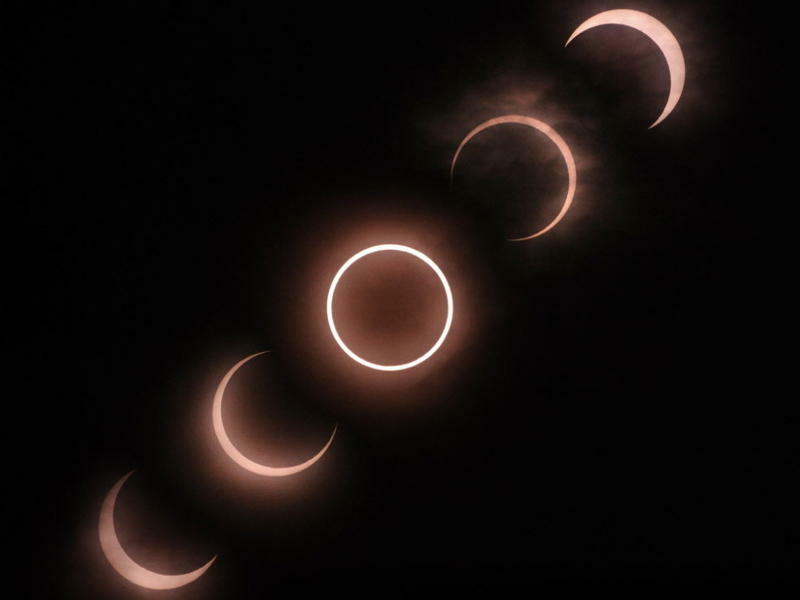 "That's got to be the prettiest thing I've ever seen," Brent Veltri of Salida, Colo., told The Associated Press, when asked about the eclipse of the sun that was visible across the western U.S. on Sunday afternoon and in much of Asia earlier today.